Relative Feed Value has been of great value in ranking forages for sale or inventorying and assigning forage to animal groups according to their quality needs. With the introduction of the new approaches to determining animal requirements in National Research Council Nutrient Requirements for Dairy Cattle (2001), there is an opportunity to improve upon this quality index through use of newer analyses and equations. 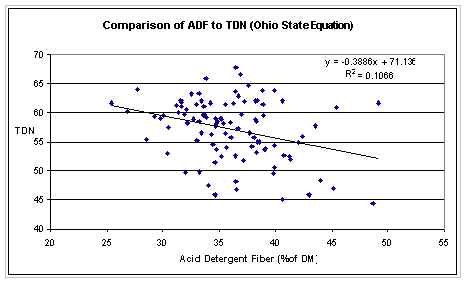 Dry matter intake was estimated from NDF and DDM from acid detergent fiber. 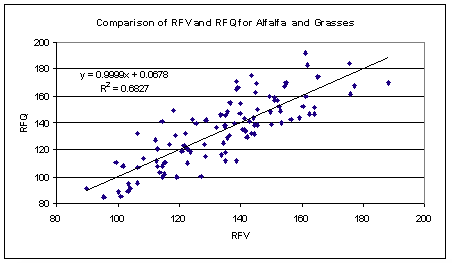 The constant, 1.29, was chosen so that RFV = 100 for full bloom alfalfa. 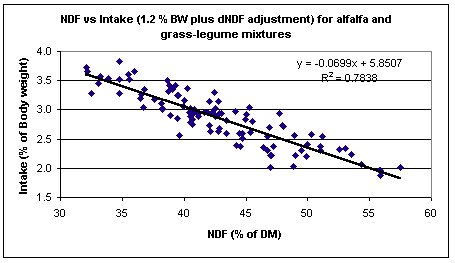 The constant was the expected DDM intake, as % of BW, for full-bloom alfalfa based on animal data. Mertens, D. R. 1987. Predicting intake and digestibility using mathematical models of ruminal function. J. Anim. Sci. 64:1548-1558. Moore, J.E., and W.E. Kunkle. 1999. Evaluation of equations for estimating voluntary intake of forages and forage-based diets. J. Animal Sci. (Suppl. 1):204. Moore, J.E. and Daniel J. Undersander. 2002. Relative Forage Quality: A proposal for replacement for Relative Feed Value. 2002 Proceedings National Forage Testing Association. Moore, J. E. and D. J. Undersander, 2002. Relative Forage Quality: An alternative to relative feed value and quality index. p. 16-31 In: Proc. Florida Ruminant Nutrition Symposium, January 10-11, University of Florida, Gainesville. National Research Council. 2001. Nutrient requirements of dairy cattle. 7th rev. ed. Natl. Acad. Sci., Washington D.C.
Oba, M. and M. S. Allen. 1999. Evaluation of the importance of the digestibility of neutral detergent fiber from forage: effects on dry matter intake and milk yield of dairy cows. J. Dairy Sci. 82:589-596.